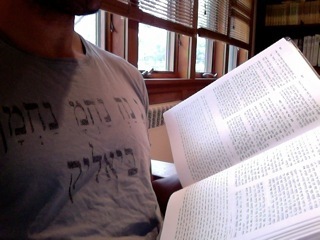 In other reviewing news, Josh Lambert over at Tablet Magazine, lists a number of interesting recent and forthcoming publications on identity and conversion, including Matthew Thiessen’s Contesting Conversion: Genealogy, Circumcision and Identity in Ancient Judaism and Christianity, and an edited volume entitled Sacrifice, Scripture and Substitution: Readings in Ancient Judaism and Christianity. Also of some interest is Yoel Finkelman’s forthcoming book on Artscroll (scroll down). I got a bit of a later start on Tuesday than I had on Monday. Busy packing up our London apartment for our move back to New York – my wife and daughter had already made their way home a week earlier – I ended up missing the first two lectures of Tuesday’s initial block of sessions. Fortunately, I managed to attend several fantastic lectures over the course of the day. As soon as my Northern Line train pulled into Waterloo Station I navigated my way through the complex maze of underpasses leading to the King’s College campus, and dashed upstairs to the “Non-biblical Dead Sea Scrolls: Themes and Perspectives” section. This session was convened specifically to address the topic, “Images of the Feminine in the Dead Sea Scrolls.” I arrived just in time to get my laptop ready for Claire Ruth Pfann’ (University of the Holy Land) presentation entitled, “Women at Qumran: Fact or Fiction?” Making use of what she referred to as a revised version of De Vaux’s chronology of the site, Pfann concluded that throughout the history of habitation at Qumran, finds that might indicate the presence of women (e.g. hairnets, feminine fabric patterns, jewelry, spindle whorls, etc.) are absent. During the period Pfann has designated IIb (66-68 CE), however, we begin to find in sealed loci possible indicators of female habitation of the site. These finds continue to appear in layer III (post-73 CE). Pfann thus sees evidence for Revolt-related female habitation at Qumran just prior to the revolt (during a period beginning in 66 CE), but not beforehand. The discussion period following Pfann’s presentation produced the most heated exchange that I had seen at SBL to that point. Jodi Magness (University of North Carolina at Chapel Hill) questioned Pfann’s decision to posit a separate stage of habitation commencing in 66 CE, rather than a single period beginning some time early in the reign of Herod Archelaus (i.e. around 4 BCE). Pfann’s view, doggedly defended during the subsequent session break by Stephen Pfann (University of the Holy Land), is that an observable change in material culture before and after 66 CE – as well as the eventual presence at the site of Revolt-era coins (97 from Year 2, and 3 from Year 3) – is sufficient to suggest a separate habitation, which may be dated to 66 CE. Magness countered – as far as I could understand (and hear…things got pretty tense!) – that no “change in material culture” in fact occurred. Instead, the original inhabitants from approximately 4 BCE simply adapted to evolving tastes in dishware and the like. In other words, Magness strenuously insisted, no evidence exists that should force us to suggest a fresh habitation of the site in 66 CE. Once presentations resumed following the break, I returned to the same section only to encounter my least favorite presentation of the conference: Paul Heger’s (University of Toronto) paper entitled, “The Status of Women in Scripture, Rabbinic and Qumran Literatures.” At the risk of oversimplifying things (although this tendency was precisely my problem with the paper itself), Heger argued that while the Bible, the Dead Sea Scrolls and rabbinic literature all more or less agree that women possess a subordinate legal status, the Rabbis venture even further in saddling women with a subordinate social status as well. 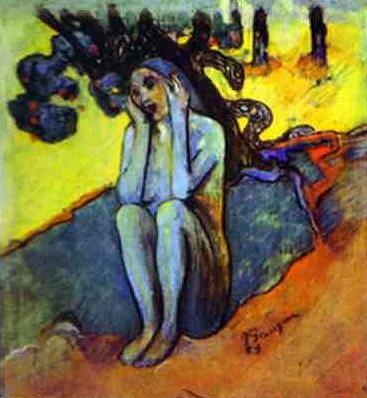 Paul Gaugin, "Eve - Don't Listen to the Liar.' 1889. Watecolor and paste. Marion Koogler McNay Art Museum, San Antonio, TX. courtesy of wikicommons. Heger introduced his lecture by presenting what he saw as a simple, unbiased reading of the Fall from Eden narrative. In Heger’s view, the text does not fault Eden any more so than Adam for sinning against God; in fact, as Heger implied at several points during his talk, the biblical narrative may even skew against Adam on occasion. Heger then seemed to assume that the soundness of his reading should be readily apparent to most, perhaps all those who engage the text. Given this, Heger employed his reading as the standard against which both Qumranic and rabbinic interpretations should be measured. Heger then proceeded to highlight commentary on this narrative from various Dead Sea Scroll sources, which he noted tended to see this episode as a cautionary tale against man’s lustful and generally sinful nature. Eve, he noted, is not implicated as a villain in these readings. In contrast, Heger pointed to a slew of rabbinic texts, culled from sources as diverse as the Tosefta, Genesis Rabbah, and the Bavli, that cast Eve, especially her feminine sexuality, as the primary culprit in humankind’s Fall. Although noting that exceptions exist, Heger viewed this as the dominant depiction of Eve within rabbinic literature, and as such an indicator that the Rabbis went further than other erstwhile Biblical interpreters in marginalizing women. Heger noted, however, that the Rabbis may not have been directly concerned – at least in this context – with women’s social status per se. Their excessive social demotion of women, therefore, may have been a mere byproduct of an earnest inquiry into the dangers of sexual temptation for males concerned to avoid transgression. I found Heger’s paper deeply unsatisfying from both a methodological and interpretative perspective. During the discussion period I raised several points with respect to the former. First, I asked that we consider the hazards of attempting to create a coherent programmatic statement out of rabbinic texts drawn from a variety of disparate geographical and chronological contexts. On a related note, I pointed out the problematic nature of referring to “the Rabbis” – as if reducing several hundred years of complex and multivalent development into a single corporate identity somehow makes things simpler instead of vastly more complicated. Finally, I commented that some of the texts to which Heger pointed over the course of his analysis (BT Yoma 18b, in particular) have actually been noted for their reflection of a specifically Sasanian milieu, rather than as merely several points on a broad, rabbinic continuum. Heger responded rather forcefully that by no means had he suggested that “the Rabbis” only had negative things to say about women. The denigration of Eve, however, is so pervasive throughout rabbinic thought that, in Heger’s view, we may deduce the rabbinic view of women (or some part of it) from the texts in which it appears as a theme. I did not feel at all that this answer addressed my question. Following Heger’s paper, those who stayed until the end of the morning session were treated to a phenomenal paper by Shani Tzoref (listed as University of Sydney, but announced beforehand as affiliated with the Israel Antiquities Authority). This paper remained my favorite of the conference. Hopefully I’ll have a chance to cover this paper, along with the rest of the lectures I attended throughout the remainder of Day 2, in a subsequent post. Ari Lamm is concluding a year as a Fulbright scholar based at University College, London and the School of Oriental and African Studies.